OTTAWA, ON – September 26, 2018 – ThinkRF Corp., the leader in software-defined spectrum analysis solutions, today announced the release of the ThinkRF R5700 Real-Time Spectrum Analyzer with GNSS. Unlike other handheld portable spectrum analyzers, the ThinkRF R5700 analyzer is the only one that combines the performance needed to cover the 27 GHz frequency range with the portability and form-factor required to be easily used in a vehicle. To accompany the R5700 analyzer, ThinkRF has also released the ThinkRF P120 Vehicular Power Conditioner. 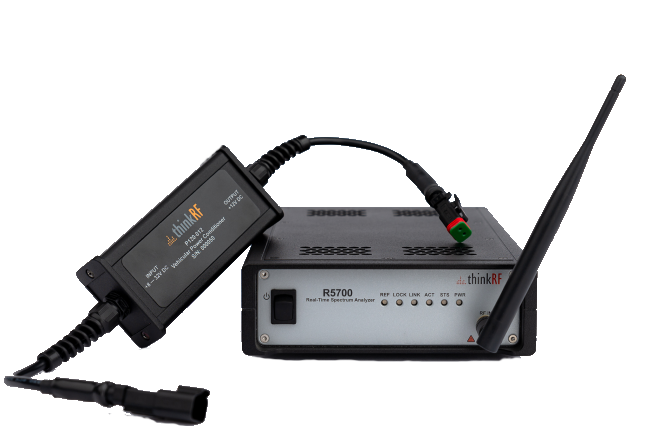 It is designed to provide regulated power to portable equipment while protecting from vehicular power transients This allows spectrum analysis equipment, including all ThinkRF real-time spectrum analyzers, to be powered in standard vehicles via power outlets or directly from the vehicle battery. When combined, the two products enable advanced mobile spectrum analysis and drive testing capabilities for RF engineers and monitoring program managers in government, aerospace & defense, and telecom. The ThinkRF R5700 analyzer and ThinkRF P120 conditioner will be available to order immediately.